The event encourages students to stay off the roads and have substance-free fun. Seneca seniors will have the opportunity to win a 2008 Ford Focus at this year’s Prom House 110 Carranza event. 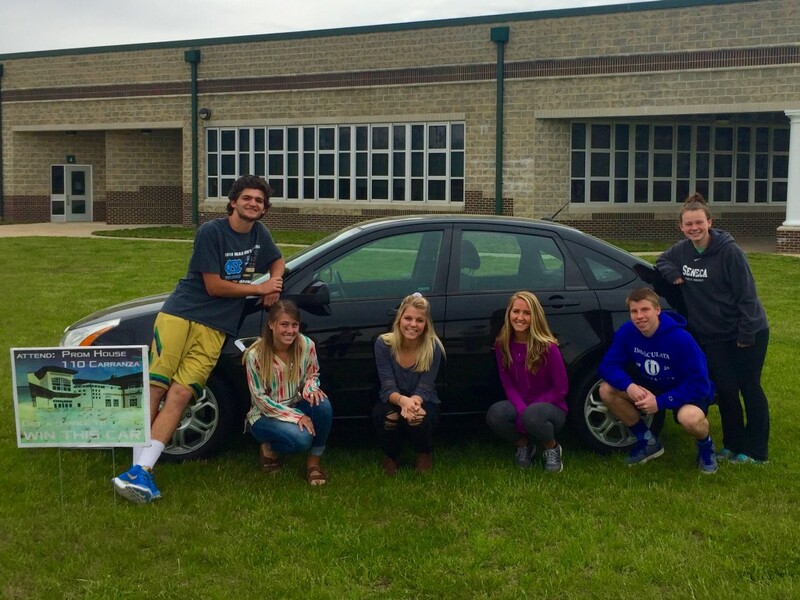 Pictured is the student council executive board with the prize car: (from left) J.J. Scarpello, senior; Jenna Ingrao, senior; Allison Lyons, senior; Darci Dimming, senior; Sean Barnard, junior; and Kasey Mitchell, junior. The after-prom celebration designed to keep students safe and out of trouble, Prom House 110 Carranza encourages students to stay off the roads and have substance-free fun. Seniors and their prom dates, as well as seniors not attending prom, are invited to participate in the lock-in event from midnight to 6 a.m. on May 20, following prom. The high school’s small gym, gym and auditorium will be set up with food, games and entertainment throughout the night, ending with prize giveaways and the chance to win a Ford Focus donated by Medford Ford. Scarpello has been a member of student council since his freshman year, the year Prom House 110 Carranza originated. The event is presented annually at the New Jersey Association of Student Councils Convention and has been awarded Top Ten Projects by the NJASC. Jenna Ingrao, senior student council executive officer, said the Prom House 110 Carranza event eliminates the need to drive after prom. “Your bus or limo drives you to prom so they can just drop you off right at the school and you’re not driving down to the Shore, which is close to an hour, at midnight or 1 a.m., which can be dangerous,” Ingrao said. According to Erica Maira, student council advisor and guidance counselor, an 80-foot boardwalk was built by the high school’s woodshop that will travel from one end of the small gym to the other, decorated with games and attractions one would find on a typical boardwalk. When students arrive, they will first be served breakfast, prepared by the cafeteria staff. The attendees will then have the opportunity to attend an illusionist act, participate in a lip-syncing battle and, later in the night, watch a comedic magic show. Throughout the night, there will also be numerous arcade games, life-size board games such as Jenga and Connect Four, and minute-to-win-it games taking place every 15 minutes. Students can win tickets at every station they visit, which can be used to win prizes, donated by teachers and community members, at the end of the night. Prizes include iPads, Apple watches, GoPro cameras, Keurig coffee makers, TVs and more. According to Maira, there are about 250 students expected to attend, approximately two-thirds of the senior class, and they will all move together from one station to the next. “It’s really important for the kids to feel like they belong to something, so the whole 200-plus of kids move together throughout the night,” Maira said. Along with teachers and staff, juniors primarily run the event. “By working the event, you see how much time and effort has been put in by your teachers and fellow classmates, so when you go and attend it, it gives you a greater appreciation of your school and everybody in it,” Scarpello said. Seniors tend to think of the event as a last chance to see friends before graduation and leaving for college, Allison Lyons, senior student council executive officer said. Tickets to attend are $5 for any senior in good standing, those who attend prom and their dates. A signed permission slip is also required. Students who attend are required to stay for the entire event. For more information or to donate to the event, contact Maira at emaira@lrhsd.org.